Eric Mallinson was born at Holmbridge, near Holmfirth, on the 21st of January, 1922. His father, Wilfred, was a stone mason by trade and had served in the First World War. His mother Ada, sisters Doris and Gladys and brothers Tom and Jack completed the family. Eric attended Brockholes Church School from the age of 11 to 14 and then became an apprentice stonemason until he was 19. Eric recalls hearing the sound of sirens on the first night of the war. His brothers were both called up – Tom served with the Northumberland Fusiliers and his older brother Jack with the Royal Army Service Corps in North Africa, Italy and France. Early in 1943, Eric left for North Africa. On arrival at Algiers he recalls the ship’s guns firing at a Spitfire, but the shooting stopped when they realised it was an allied aircraft. His first action was very frightening, the Germans had already taken one platoon prisoner and some had been killed at that time. Eric’s unit was told to fix their bayonets. They walked straight into heavy machine-gun fire, and Cpl Warren was shot through the stomach. Eric was hit by a ricochet bullet and winded, though many of his comrades were killed during that night. During that period Eric went on a night patrol wearing shorts and the night was very cold, after two and a half hours they were all frozen. On the way back they walked into a minefield and many were wounded. A ball bearing pierced Eric’s shoulder and he spent a week in hospital. Before leaving North Africa, Eric and another soldier were chosen to go on the Victory March at Tunis. They were given new kit which was rather uncomfortable and chafed. The campaign was over and they were taken to Cap Bon. On one occasion he missed the transport back, following a day’s leave in Tunis, so some Redcaps found him somewhere to sleep, though it was rife with mosquitoes. The next morning the Redcaps took him back in a wagon, luckily he was not put on a charge. In fact he returned to the battalion to find his Commanding Officer, Lieutenant Colonel Webb-Carter, washing his hair! Eric was sent back to C Company as a cook in the cookhouse. From North Africa he took part in the invasion of the island of Pantelleria. The troops faced no resistance from the Italians, taking the Island without loss of life. He remained there for a few weeks. Later he found himself on the Anzio beachhead and, working as a cook, assumed he would be out of the line of fire. However, Eric soon reverted to his role as a Bren gunner. The Anzio landing was straightforward. The men were given a tot of rum, they thought they would meet opposition but, initially, they didn’t. Even when they landed there was no enemy action. They found a cattle shed to sleep in and spent about a fortnight there before moving on. Later, though, the horrendous conditions on the beachhead soon started to impact on the men and casualties mounted. There was a good deal of shellfire preventing any movement in daylight. Lance Corporal Thomas was killed on the Anzio beachhead and Eric lost two more mates whilst in the trenches there. The Germans seemed to be encircling them and one injured lad was carried in with the help of a German POW. It was very cold at Anzio. Meals were sent up to the troops and they had K rations and little heaters for tea. At a railway line the Germans came over one night and attacked them and quite a few ‘Dukes’ were wounded, – Eric often wonders why he came through it when so many others didn’t. His comrade, Clifford Garlick, had to bury his mate after this attack. The trenches filled with water, often up to the men’s knees. Eric was on guard one night when he heard shells coming in close. One hit the next trench and killed the lad in it and then Eric and Clifford’s trench collapsed on them. Eric could hear shells and the big railway gun ‘Anzio Annie’ firing. He saw “Shell-shocked people looking vacant.” They started withdrawing; they had just reached a First Aid Station and got into a tent, when a German aircraft strafed it and quite a few men were wounded. 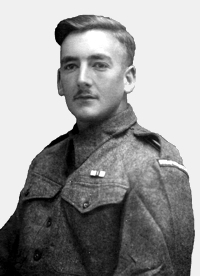 Eric stayed with the battalion until near Bologna, where he missed the action as he returned to work in the cookhouse. His next destination was Haifa, in Palestine, where he worked in a proper battalion cookhouse. From there he went into Syria, to Damascus, and Beirut, then by train to Ismailia in Egypt. 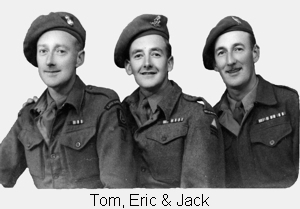 Eric and Clifford were asked to join the Army Catering Corps (ACC), and Eric was made a full Corporal after a few months. By the final stages of the war they were feeding approximately 800 men. When he came home he found it really difficult to settle, his comrades had gone and he had to finish the last months of his apprenticeship. He married Doreen in 1947 and when their daughters were born life was sometimes a real struggle. Eric was always busy, building walls and houses and he stayed in the building trade until retirement – “always having to graft to make ends meet.” Uncomfortable in crowds, Eric also suffered from nightmares and couldn’t sleep at times; the unrecognised legacy of combat. This is a record of Eric Mallinson’s service with the Duke of Wellington’s Regiment during World War 2 from 1942 to 1945.